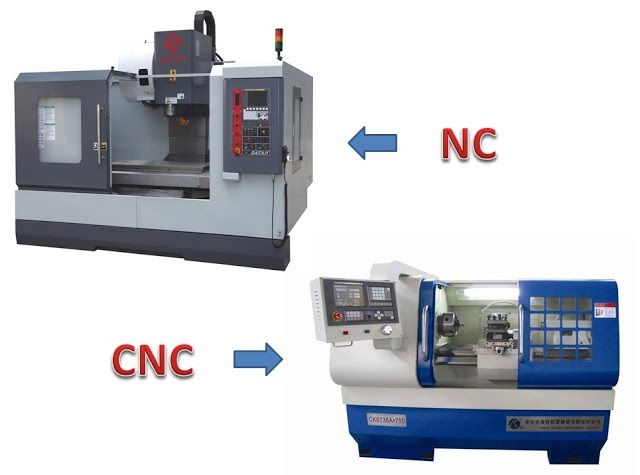 Today we will discuss about difference between NC and CNC machine.NC stands for numerical control whereas CNC stands for computer numerical control.In today’s world every manufacturing industries wants high accuracy products in less time.And this complexity of high accuracy in minimum time can be achieved by use of NC and CNC machine. These both machines work on feeding mechanism in which we command the machine in some defined code language and the machine compile and convert it into machine language and perform the predefine operation. Most of us do not know the basic difference between these machines. Here we will discuss about the basic differences among them. 1. Here NC stands for Numerical Control CNC stands for Computer Numerical Control. 2. It is defined as the machine which is controlled by the set of instructions in the form of numbers, letters and symbols. The set of instructions is called as program. It is defined as the machine which is used to control the motions of the workpiece and tool with the help of prepared program in computer. The program is written in alphanumeric data. 3. In NC machine the programs are fed into the punch cards. In CNC machine the programs are fed directly into the computer by a small key board similar to our traditional keyboard. 4. Modification in the program is difficult. Modification in the program is very easy. 5. High skilled operator is required. Less skilled operator is required. 6. Cost of the machine is less. Cost of the CNC machine is high. 7. Maintenance cost is less Maintenance cost is high. 8. The programs in the NC machine cannot be stored. In CNC machines, the programs can be stored in the computer and can be used again and again. 9. It offers less flexibility and computational capability. It offers additional flexibility and computational capability. 10. The accuracy is less as compared with the CNC. It has high accuracy. 11. It requires more time for the execution of the job. It takes very less time in the execution of the job. 12. It is not possible to run it continuously. It can be run continuously for 24 hours of a day. In NC machine if and error occurs in the program than its debugging and modification is not easy. In CNC machine the debugging and modification is very easy.